Andale defeated Andover Central, 28-21, in the season opener. The win marked former assistant coach Dylan Schmidt’s first contest as Indian head coach. Andale returned just three defensive starters off an 8-2 squad that permitted 20.3 points a game in 2016. “We really played a good game, we just gave up a couple of big plays, and those big plays were for touchdowns,” Schmidt said. The victory yielded the most points Andale’s defense has allowed all season. The 12-0 Indians have permitted just 8.3 points per contest, the second-ranked scoring defense in all of Kansas 11-man football behind 2-1A’s Smith Center (5.9). “After Week 1, we just did a better job of guys being more assignment-sound, and understand what their responsibility was, and so, we didn’t give up those big plays anymore,” Schmidt said. Limiting big plays and a massive edge in turnover margin have propelled Andale to its fourth state game in school annals. The Indians won three crowns (‘06, ’07 and ’14) under legendary coach Gary O’Hair, now a teacher in New Mexico after he retired from Andale last year. “That’s been a lot of fun to see our defense play that well,” Schmidt said. Those two traits are likely a significant key if Andale is to pull the upset against 12-0 Bishop Miege in the Class 4A, Division I state championship game Saturday. Start time is 1 p.m. at Hummer Sports Complex in Topeka. Miege has captured the last three state titles, part of a dominant run through the classification. In 2014, Miege defeated Topeka Hayden, 42-35, for the championship. Two years ago, the Stags rolled over Andover Central, 68-12. Last season, Miege defeated Buhler, 53-21. Miege is 7-3 all-time in state championships. This season, De Soto, a 10-2 squad with a defense that led 4A-I most of the season, fell twice to Miege. In the district contest, De Soto played well defensively before Miege pulled away for a 31-0 win. Last week, Miege trailed by 10 early and quickly turned the tide with big plays and went on to win 56-24. Schmidt brought up last week’s Kansas State 45-40 road victory against then No. 13 Oklahoma State as a possible parallel to Andale/Miege. K-State outrushed the Cowboys, 217-85, and picked off two passes. The Wildcats had the ball for just over 10 more minutes than OSU. After De Soto went up 17-7, Miege scored a 74-yard touchdown run from sophomore Brison Cobbins on its first offensive play. “Kind of brought the nerves back down a little bit,” Miege coach Jon Holmes said. Then, senior strong safety Jasir Cox, a first-year transfer from Raytown South (Mo. ), had a key interception that helped put the Stags up 21-17. After the INT, Cox flew down and made the special teams tackle. A first team all-Eastern Kansas League selection, Cox has 77 stops and a team-high four interceptions. His brother, Jabril, plays for FCS power North Dakota State, though Cox has received limited collegiate interest. Holmes took to Twitter after the win to try to help Cox’s recruiting. 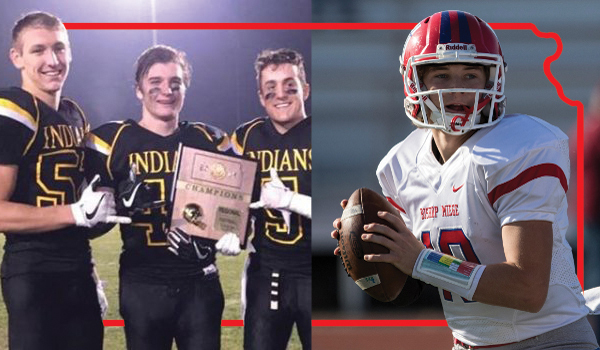 In the contest, Miege senior Carter Putz, a Notre Dame baseball signee, broke the state’s all-time passing record for yards. Putz also holds the single season and career records for passing scores. After he threw for a state record 50 TDs in ’16, Putz sits at 144 of 192 passing for 2,539 yards with a 34/4 TD/INT ratio. For his career, he has thrown for 9,031 yards and 120 scores. Additionally, senior center Jack Burns recently committed to the Ivy League’s Cornell University. Burns has started at three positions on the offensive line in the last three years. Burns replaced standout Colin Grunhard at center, a four-year starter who made 50 straight starts. He will be the first Miege player to sign with an Ivy in Holmes’ 14 years on the Stags’ staff. Miege’s offensive line features two first-year starters and a sophomore. “Finishing blocks,” Holmes said. “You watch our film, and it always seems to be Jack fighting right until the whistle, and he is knocking guys down on their back. In addition to Putz, Burns and Cox, Miege had five other first team all-league players. Cobbins, after a standout freshman year, has 106 carries for 1,221 yards and 14 scores. Sophomore Daniel Jackson, one of the state’s biggest breakout players, has 48 catches for 1,140 yards and 15 TDs. Defensively, junior defensive end Jalen Williams (team-high 24 TFLs), junior linebacker Dylan Downing (Miege-best 126 tackles) and standout senior defensive back Cameron Key (nine passes defended) collected first team. Miege leads the classification by a massive margin with 50.6 points per contest and has permitted just 11.6. Holmes gave credit to multiple seniors, some who have played little in past years and/or had injuries. Cameron Clark has 845 rushing yards and 10 rushing TDs. Receivers Quinn Schieber and Peyton Hamrick have combined for 48 catches, 12 for scores. Linebacker Joe Watskey has 100 tackles and defensive lineman Connor Dumit has 14 TFLs. “Breakout years as seniors that really I’ve felt like have put us over the top from time to time,” Holmes said. For Andale, two seniors - wide receiver/defensive back Parker Bruce and lineman/linebacker Grant Fairchild - have shined on both sides. In a 48-20 win in Week 3 against high-octane Mulvane, Andale had five first-half turnovers, including a pair of interceptions from Bruce. Andale picked off three passes, all in the second half, in a key 17-6 district victory against rival Buhler. In the playoffs, the Indians beat Wamego (64-13), defeated Andover Central in a rematch (40-10) and beat McPherson (20-13). Last year, McPherson defeated Andale in the first round. In the second victory over Andover Central, Bruce had a key INT to set up a short field. Versus McPherson, Andale forced five turnovers, including two miscues that led to points. Andale has traditionally been a 4-3 defense but has used multiple defensive looks including three- and five-man fronts. Tim Fairchild, the father of Grant and junior Mason, a returning starter at tight end/defensive end, is the Indians’ longtime defensive coordinator. “(Grant’s) just a guy that people better account for, because he is going to make tackles, and he is going to make plays, and he is going to be physical, and so forth,” Schmidt said. “Parker, it’s been unbelievable what he has been able to do from a turnover standpoint. “He’s got eight or nine interceptions on the year, a bunch of fumble recoveries and forced fumbles, and he just has a knack to create the turnover, create the takeaway, and be around the ball,” he added. Andale has used two quarterbacks all year with a balanced backfield. Junior Ethan Baalmann and sophomore Easton Hunter are similar players. The statistics were very close, though Baalmann has pulled ahead in rushing yards. Baalmann played some last year and entered this fall with a stronger overall knowledge of the offense. Schmidt expects both to see significant time Saturday. “You are really looking at a very similar kid,” Schmidt said. Senior lineman Hunter Barbeau has anchored a line that has averaged 42.6 points a contest. Grant Fairchild and senior Steven May, along with juniors Ethan Shackelford and Cooper Venjohn have started up front. Andale had missed senior Jeremy Jansen, a starter at running back/defensive back in ’16, due to nagging hamstring/ankle problems. Schmidt said they “hope to use” Jansen at state. Junior Sawyer Simon leads the team with just under 1,000 rushing yards and was the team’s leading receiver for part of the year.